Although there is no law (yet) that prohibits you from using a cell phone while walking, or even while crossing the street, you want your full attention on the road when you are crossing. So, feel free to use your cell phone while you’re walking on the sidewalk happily Instagraming, Googling or texting, even though it makes you oblivious to all the wonders of the present moment. But... the second you reach the edge of the sidewalk and need to cross the street, even at a signal controlled intersection, you need to put your cell phone down! 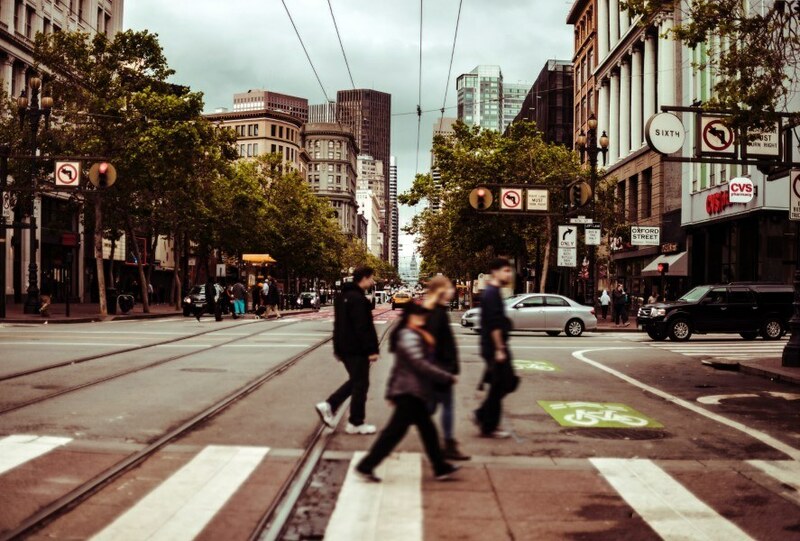 Although a car who hits you while you are in a crosswalk is typically at fault, you could be held partially liable if you are not paying full attention as a pedestrian on a public roadway. Just like your mom used to tell you when you were a kid, you need to look both ways before crossing the street. I know this sounds obvious, but pedestrians so frequently fail to do this, because they believe that they have the right-of-way (which is usually true) but this fact does not protect you if you get hit by a car. Another big reason people fail to look both ways before crossing is that they rely on traffic signals to protect them. Traffic signals may help, but they do NOT guarantee safety for pedestrians. Listen to your mom! When you are a pedestrian crossing at a stop sign controlled intersection, I highly recommend that you make eye contact with the driver approaching or at the crosswalk. Although it may appear that a car coming your way will stop because you are in the crosswalk, that is not always the case. Often, drivers are distracted and simply slow down at stop signs and then roll through the intersection. Unless you are certain that that driver sees you (by making eye contact with them) then you are not safe to cross. No, I don’t mean you have to walk around the city wearing a bright orange vest, but you do want to make sure you are visible to oncoming traffic when you are crossing the street. One way of doing this is to ensure that you are crossing in a lighted crosswalk. If it is dark, and the crosswalk is not lighted, then you want to be sure that all traffic is either already stopped, or you have made eye contact with oncoming traffic. Sometimes, it’s even helpful to use your cell phones flashlight application, this is helpful for cars to see you better at night. As I said above, too often pedestrians rely solely on traffic signals like stop signs, red lights at intersections, or the walk symbol at crosswalks. However, these traffic signals are not a foolproof way to assure pedestrian safety. For instance, even if you have a green light to cross the street, cars can make a right turn or even yield and make a left turn across your path. So, even if you have a green light, be aware of your surroundings and proceed with caution. I know all of this may seem very basic, but sometime we need to get back to the basics! Now, put that cell phone down, put your head up and make eye contact with people. What a concept! If you or someone you care about needs an experienced pedestrian accident lawyer, contact us today for a FREE online case evaluation!